AFC Fylde boss Dave Challinor believes his side go into this Saturday’s game against Leyton Orient as the underdogs – despite sitting 16 points ahead of them in the league table. 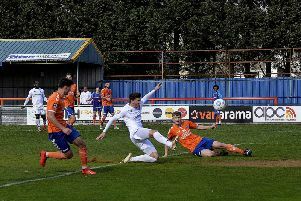 The Coasters’ recent form, which has seen them win seven of their last 10 games, has coincided with them climbing up into the National League play-offs. On the other hand, Leyton Orient continue to struggle having only been relegated from League Two last season. Although their form has picked up in recent weeks following the appointment of Justin Edinburgh, the O’s remain in 17th – just six points ahead of the drop zone. In the first meeting between the two sides earlier in the season, AFC Fylde came away with a 2-1 victory at Brisbane Road. Despite having all the statistics in their favour for the reverse fixture at Mill Farm this Saturday, Challinor insists his side still have it all to do. He said: “In this league, regardless of who you play, all games are tough. “Leyton Orient are a really good side. They came out of the Football League last year and aren’t doing as well as they might have hoped. “But when we went down there it was backs against the wall at times so we’re expecting a really tough game. “Regardless of league positions, we’re probably still the underdogs. If someone had said you’ll be playing Leyton Orient at home with us in the play-off positions and them a bit further down towards the bottom, we certainly would have taken it. “So we’ll have to be at our best to get anything from the game. “They’ve obviously struggled a bit but they’ve done better since changing managers, they’re a bit more settled now. “But they’re a really experienced team. They’ve got Football League players throughout their side and obviously some youngsters in there as well who are learning their way in the game. “I knew it was always going to be tough for them. They’ve got a big stadium, a big crowd and a good atmosphere, and I think earlier in the season teams were going down there and enjoying playing there. The Coasters, who picked up a 2-1 win on their travels last weekend at Gateshead, have no fitness doubts ahead of this weekend’s fixture.